LUCY BURDETTE: Every once in a great while, an idea for a short story pops into my head. I don’t find these easy to write, and of course the idea has to be a perfect jewel—something that can draw the readers in quickly, not overwhelm them with characters and backstory, and get wrapped up in a short time. Ha, nothing to it! But I do have one coming out in November in the Level Best Books’ anthology, RED DAWN. And then I saw a group of women in Key West playing mah-jongg by the pool. This was already an activity that Miss Gloria loved. I could imagine that in between hands, the women would gossip about unusual events on the island. I joined the real players one morning to watch them play, to learn a bit about the game, and to take notes on the exchanges between the ladies, and the setting. Into the file went those pages. Next, John and I went to Utah for a wedding a year and a half ago, and returned via Las Vegas. The fellow sitting next to John on the plane turned out to be a professional gambler. It was so interesting to hear him describe how he studied his competition—what he noticed and then how he used these observations in his betting. I took furious notes. And then filed them away. And then the wonderful editors of LEVEL BEST BOOKS, who publish an anthology of crime fiction by New England writers every year, announced that this November’s issue would be their swan song. I sure wanted to get a story in that collection! I thought of a title that I’d pitched more than once for one of the Key West mysteries: LAST MANGO IN PARADISE. Neither my editor nor the rest of the staff liked it. So now I had motive, characters, action, setting, and a title. All I had to do was write and submit. Ha! Even after Mrs. Silpat was poisoned to death in her Key West conch cottage, the mah-jongg players would not eschew refreshments. Or so insisted my geriatric houseboat-mate, Miss Gloria. If anything, she added, the shock was likely to render the ladies ravenous. The tragedy had unfolded the week before when Miss Gloria went to pick up her friend for their regular game. Mrs. Silpat had not been her favorite friend--she wasn’t loyal. She put herself first in any situation. And anything she baked ended up tasting like sawdust or old chicken fat. All that aside, years of clacking tiles together, chatting about families scattered to the winds, and exchanging recipes, meant something important in Miss Gloria’s book. Miss Gloria had knocked loudly several times on Mrs. Silpat’s door and finally went in without an invitation. When she found the woman collapsed in her kitchen, by all appearances dead, her first call was to me--a food critic, not a cop. “I’m too shook up to think,” she’d said. By the time the pink cab dropped me off in the narrow one-way street in front of Mrs. Silpat’s eyebrow-style house with gingerbread trim, two police cars with their lights flashing flanked Miss Gloria’s old Buick. A fire department EMT van had nosed into her driveway. I hurried onto the porch but was instantly repelled by a cop in polyester blue. As I settled into a wood rocker, an enormous fluffy cat the color of salted caramel leaped onto the porch and wound in figure eights around my legs. Miss Gloria burst out of the house; the screen door slammed behind her. The words sounded tough from an old lady who’d just lost a friend, but I could see the tremble in her lower lip. The big cat approached Miss Gloria and meowed. “Oh, Mango,” said Miss Gloria, tears filling her eyes. She leaned over to ruffle the tufts of fur behind his ears. “I'll have to let Miriam know he's here. She lives nearby and she loves cats and I bet she’ll want to take him in, poor guy. And oh lordy, the other girls will be wondering if I up and croaked. Anytime I’m a little late, they think I’ve been called to the great Beyond.” She whipped out her cell phone and began texting the news of the cancellation of the game and more importantly, Mrs. Silpat’s death. And you can buy this fabulous collection of stories on Amazon or at the Level Best Books website. Congratulations,Lucy, on having your story selected for the anthology . . . the beginning is certainly intriguing; I can't wait to read the rest. Congratulations, Lucy. Thanks for sharing your short story writing process. It was quite an adventure. Can't wait to read the rest of the story and see how the gambler tidbits fit in. Love the story, Lucy! Can't wait to get my copy of the anthology at Crime Bake. Love anything with a cat! Whatever happened to Jack Getze? Thanks guys. Yes, Susan, I need to let him know his idea went to good use! Alas Susan Elia, you are not rid of me. Jack is always lurking. I've been busy writing, of all things. Big congrats on getting in the anthology, Roberta. Everybody sends something, so the competition is tough, but I can already see why yours made the cut -- I'm hooked from the opening. I remember saying you could have the cat story, but darn if I remember what the story was. Have to buy the anthology, which was probably your tricky idea the whole time. Done today. I did get a glimpse of Edith in the book room but sorry I missed everybody else at Bouchercon. I always end up hanging with the wrong crowd. Those noir people are so dark. Congratulations! I can't wait to have you sign your story for me at Crime Bake. I find short stories to be very difficult to write, until that certain idea takes hold. Love that yours ties into your series! Good to hear from you, Jack. Your posts are always refreshing. Mrs. Silpat! You had me at the name. And of course a cop with a hand the size of an oven mitt. Irresistible. Lucy, you've outdone yourself. And kudoes to Jack Getze for his generosity. Sorry I missed you, Jack! Congrats, Lucy! I remember enjoying the first draft. The details you’ve added make it even better and the new title is perfect. I’m looking forward to reading the whole story. I love the last sentence . . . and lucky for me, there will be more great sentences in November! I love short stories! They're fun and I love when they fill in the gaps between stories!! I love the title. And this tease. And I can't wait to see how the gambling bits fit in. And as a Level Best editor, let me say, we are happy for your inspiration (and perspiration). Thanks everyone!! Jack, I can't say more about the idea you "lent" me, as it's too close to the ending:). Yes, noir people are dark, dark, dark. But are they like that at the bar too? I loved the first sentence! Can't wait to read the whole thing. I'm sorry, though, that this will be the last collection of short mysteries. Any suggestions as to where I can find other collections of short mysteries of the same quality? I have always wanted a Mah-Jonng set and so last Christmas I was lucky enough to receive one. Then came the process of learning the game. It has turned out to be lots of fun, but very complex. I'd be afraid to play with any of the veterans, as they have the acceptable hands memorized (which change every year, who knew?) and they can easily hold a conversation while playing. Not me, I still need to concentrate and still end up missing the tile I need. Deb, it's possible that another group of editors will step forward--fingers crossed! Also, MWA usually has a collection of short stories. Not last year, because they did the cookbook. And the Guppies often do anthologies. Kristopher, it looked very complicated. And the ladies were very serious. No talking while the hands were being played. Maybe when we all retire, we can take up the game! Thanks Debs, I guess you are on to me LOL. I never did exactly understand the objection to that title, but when you suggested it for three different books and no one jumps on it, you should get the message! There will be tons of great stories in Red Dawn. I'm really looking forward to it! Can't wait to read "Last Mango in Paradise," Lucy! 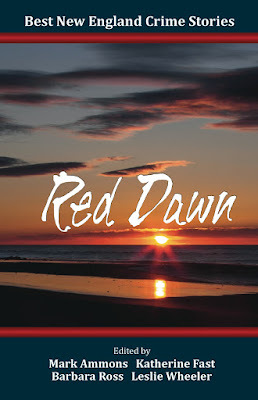 Red Dawn is on my TBR and TBB (to be bought) list now!